Rookie Walker Buehler tossed one-hit ball into the seventh inning, Cody Bellinger and Max Muncy slugged two-run homers, and the Los Angeles Dodgers routed the Colorado Rockies 5-2 to earn a record sixth consecutive NL West title in a tiebreaker game. That sets up a wild-card showdown Tuesday night between the Rockies and Chicago Cubs at Wrigley Field. Jon Lester will start for Chicago. Colorado has not yet named a starter, but Antonio Senzatela may get the call. The Dodgers are the first major league team to win six straight division titles since the Yankees captured nine AL East titles in a row from 1998-2006. Los Angeles hosts Atlanta in the NL Division Series beginning Thursday. Ichiro Suzuki will go to spring training next season with the Seattle Mariners as a player. Seattle general manager Jerry Dipoto says Suzuki will be in spring training with the Mariners in 2019 and hinted the veteran outfielder could be on the roster when the club opens the season next March with a pair of games in Tokyo against the Oakland Athletics. Dipoto said Suzuki will be given a chance to be part of the 28-man roster the team is allowed to have in Japan, but there were no guarantees he’d have a spot on the 25-man roster when the rest of the regular season begins back home. Dipoto says the Mariners will give Suzuki an opportunity “as both a coaching presence and a player presence,” when the Mariners arrive at spring training in February. Suzuki made Seattle’s roster out of spring training this season, but moved to a special assistant role with the front office in May. The new role kept Suzuki from playing again in 2018, although he remained with the team throughout the season, taking part in batting practice with the idea of trying to return in 2019. The Dodgers led the majors in attendance this season, topping the 3 million mark. Even accounting for the usual late-arriving fans in Los Angeles, there are plenty of empty seats for the Dodgers’ tiebreaker game against Colorado. Each end of the upper deck has three nearly empty sections, there’s ample room in the outfield, and rows of empty seats elsewhere. A Monday day game with people at work and kids back in school surely doesn’t help. The crowd that is on hand is being loud in support of Dodgers rookie starter Walker Buehler. With two outs, they’ve been standing up and cheering for him. The Dodgers drew 3,809,684 through 81 home dates, averaging 47,033 per game. That’s well ahead of the second-place Yankees, who totaled 3,482,855. Shohei Ohtani has undergone Tommy John surgery. Angels general manager Billy Eppler announced Monday that the surgery went well. Dr. Neal ElAttrache performed the procedure in Los Angeles. Ohtani was named the AL Rookie of the Month for September, which began with an abbreviated pitching performance and the subsequent realization he needed surgery. Ohtani went on to bat .310 with seven homers and 18 RBIs, making him a top contender for the AL Rookie of the Year award. Ohtani will spend much of the offseason in Southern California for rehabilitation, Eppler said. The GM also confirmed that the Angels plan to use Ohtani as a hitter throughout 2019. He will return to the mound in 2020. Colorado right fielder Carlos Gonzalez was booed when he came to the plate for the first time against the Dodgers in the NL West tiebreaker. The crowd was reacting to Gonzalez’s comments in a column in the Denver Post on Monday in which he said he detests hearing “I Love L.A.,” a song that blares after every Dodgers home victory. Gonzalez called it “that stupid song” and says he tries to run into the visiting clubhouse as fast as he can to avoid hearing it. After Gonzalez struck out to end the second, the stadium organist played a snippet of Randy Newman’s ode to the city. Lorenzo Cain hit a tiebreaking RBI single in the eighth inning, Christian Yelich collected three more hits and the Milwaukee Brewers won the NL Central title by downing the Chicago Cubs 3-1 on Monday in a high-stakes tiebreaker game. Milwaukee trailed Chicago by as many as five games in September, but it pushed the season to an extra day with a furious finish and then used its deep lineup and bullpen to outlast the playoff-tested Cubs. Orlando Arcia, batting in the eighth slot, had a career-high four hits, and Josh Hader closed out another dominant relief performance for the Brew Crew. It’s the first NL Central title for Milwaukee since its previous postseason appearance in 2011. Cain and company will enjoy home-field advantage throughout the NL playoffs, beginning with Game 1 of their division series Thursday. The Brewers’ eighth straight win also dumps Chicago into Tuesday night’s NL wild-card game. The Cubs will host the loser of Monday’s second tiebreaker between Colorado and the Los Angeles Dodgers for the NL West title. Jose Quintana pitched six-hit ball into the sixth inning and Anthony Rizzo homered, but Chicago’s bullpen faltered in the eighth. Daniel Murphy and Javier Baez had the only other hits for the Cubs. 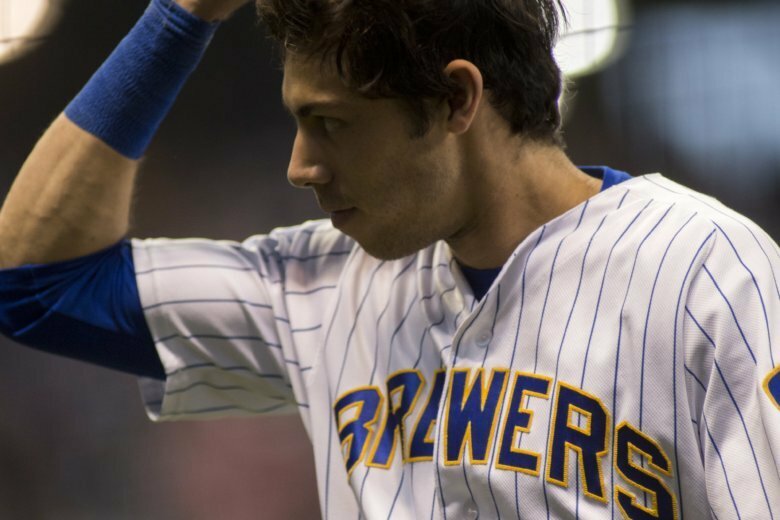 Christian Yelich strengthened his case for NL MVP when he slapped an RBI single back up the middle in the NL Central tiebreaker game, giving the Milwaukee Brewers a 1-0 lead over the Chicago Cubs in the third inning. Yelich also reached on an infield single in the first. Bidding for the Triple Crown, he now has 110 RBIs, just one behind Cubs star Javier Baez for the league lead. The winner at Wrigley Field gets the division title and home-field advantage throughout the NL playoffs. The loser plays again Tuesday night, hosting the runner-up in the NL West in the wild-card game. Jhoulys Chacin will start the NL Central tiebreaker for the Milwaukee Brewers. The 30-year-old Chacin is 15-8 with a 3.56 ERA in 34 starts. The right-hander pitched five innings of one-hit ball in a 2-1 victory at St. Louis on Wednesday night. Milwaukee plays the Chicago Cubs on Monday for the NL Central title. The winner at Wrigley Field gets a spot in the division series and home-field advantage throughout the NL playoffs. The loser plays again Tuesday night, hosting the runner-up in the NL West in the wild-card game. The Brewers did not announce their starter until Monday morning. Jose Quintana pitches for the Cubs. The left-hander is 6-2 with a 1.60 ERA in 10 starts against Milwaukee.